An essential part of being a successful poker player is finding every edge you can over your opponents to pick up as much of their money as possible. In this article, we will look at a very handy technique that will help you win money even if you are not holding a good hand. This technique is known as the poker squeeze play and when working well in conjunction with a good knowledge of your opponents playing styles can become one of the key poker moves you can develop to win extra money. In a nutshell, this is basically a preflop bluff. It happens when a player re-raises once there has already been a raise and some callers. Or put another way – it ideally occurs before the flop, when a loose player has raised and one or more loose players have gone on to call. Then by applying the squeeze, you make a three-bet that blows your opponents off the pot. So the clear objective of the poker squeeze is to get the others to fold, and when done right it can be an extremely effective online poker strategy for upping your win rate. The more you know about your opponents playing style then the more effective the poker squeeze will be. The two key traits to look for are opening raisers that are loosely or aggressively opening too frequently, and passive players who are bent on seeing cheap flops and calling. The squeeze works well in this scenario because the aggressive or loose player will open frequently with a large variety of good or bad hands and the passive player will often call to see the cheap flop regardless of what cards they are holding. In these situations, a big three-bet will force the two weaker hands to fold. This online poker strategy works in poker variations like Pot Limit Omaha and No Limit Hold’em because limit games won’t allow you to raise enough to push the other players to fold. The psychology behind the technique’s success is that the first loose player often opens big with hands that aren’t good enough for a three-bet, and the second player probably doesn’t have a great hand because they opted to call rather than raise. How big should your three-bet be? First up, like all aspects of poker, you need to size up your opponents according to their individual playing style and character type. Having said that here are some general guidelines you can start with in regards to your bet size. If you are playing against the raise and just one call then make your squeeze bet around four times what the original bet was. If your squeeze bet is against the raise and two calls then make the wager at least five times the original bet. As mentioned before these are just guidelines that need to be adjusted to the game you are in. For example, if you know that your opponents are more likely to fold regardless then you could experiment with making smaller squeeze bets. One of the primary factors that will contribute to a successful poker squeeze play is identifying which of your opponents naturally fold to three bets and which ones will play back. Work this out and it will have a positive effect on your win rate. If you are up against a player who you know really does not want to fold look at applying a poker squeeze with a wider value range, adding hands like ATs, 88, or QJs to the range. If you are coming up against tight players who are folding weakling to your three bets then feel free to throw in some more bluffing and adopt a more aggressive looser style of play. The most optimal way to make your poker squeezes more profitable is by adapting your ranges according to the opponents you are up against. For those opponents that are constantly calling and rarely if ever raising (the calling stations), this is a good situation for making big money can by squeezing these players. 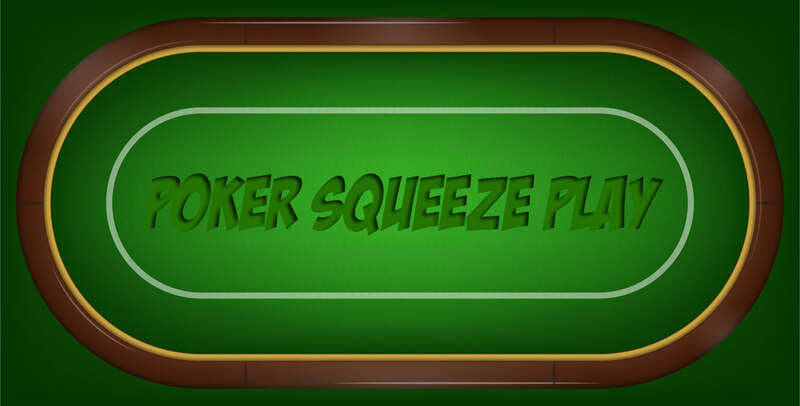 Like everything in poker, there are no guarantees and the poker squeeze play is no exception. It is not going to win every time, but if you take the time to develop this technique and incorporate it into your online poker strategy it has the potential to become a solid money making addition to your poker toolkit.